Yes, milk, once boiled, can be stored into the freezer up to 6 months. Why milk does not boil? The flame or the potency of the stove is not high enough or the pot is too thick. Can milk be boiled into the microwave? Yes, if a regular stove is not available. Yes, in general terms, every kind of animal milk can be used. Milk from goat, sheep, lama, camel..can be used. Thickness and taste can vary from milk to milk. Can vegetable milk be used for BRAVO preparation? No, it cannot. Bacteria and yeasts of Bravo require animal milk to grow and to produce in the final product hundred of molecules active on the immune system. 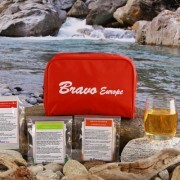 In case of intolerances to milk we suggest to use the Non Dairy Bravo kit for fermented fruit juice. Do the powders need to be stored into the refrigerator? Powders are very stable thus they can stay for weeks at room temperature. However, if the room temperature is too high or if you plan to use them not immediately it is preferable to store them into the refrigerator (not freezer) far from humidity inside their original envelope. How can I dissolve all the clumps? Take a couple of tablespoons of milk already boiled and cooled and pour them into a cup. Mix well all the powders with this tiny amount of milk; transfer the blend into the rest of the milk. No, yogurt maker MUST NOT be used. The high temperature of the yogurt maker kills many of the bacteria and yeasts of the product. What to do if after 24 hours of fermentation the product is not thick as expected. Wait further 12-24 hours without mixing it. Fermentation it’s a time and temperature dependent process. If the room temperature of the environment where you left the bowl to ferment was too low it will require longer (up to a total of 48 hours) to reach the appropriate thickness. Can Bravo be propagate dusing some leftover from the previous batch? No, Bravo cannot be prepared using some leftover from the previous preparation. This is due to the fact that Bravo powders contain colostrum which is completely used by bacteria during the fermentation process. At the end of the fermentation, no more colostrum is available in the product; this means that if some leftover is used to prepare a second batch, bacteria do not have any further colostrum to use. Colostrum is important to allow, during the fermentation process, the natural formation of molecules active on the immune system. Furthermore, Bravo formulation has been studied considering a precise ratio among the strain of bacteria and yeasts growing during the fermentation process. The cultures have to be renovated every time to keep this ratio. Can I use some liquid leftover of fermented fruit juice to make a second batch? No, the powders of the kit have been designed to prepare a new fresh batch every time. Can I drink more than 100 ml per day? The amount of probiotics and chondroitin sulfate (dietary supplement) have been calculated to provide an adequate daily amount. Increasing the daily amount would result in a too high daily dose which is not recommended. What kind of fruit juice can I use? You can use filtered juices, pure, concentrated or extracts. Also vegetable milk can be used.